International peace and statebuilding interventions have become ubiquitous since the 1990s. Their frequent failures, however, have prompted some researchers and practitioners to move beyond focusing on interveners’ ideas and approaches to analysing how their interactions with recipients shape outcomes. The recently published book by Shahar Hameiri, Caroline Hughes and Fabio Scarpello, International Interventions and Local Politics: Fragmented States and the Politics of Scale (Cambridge University Press, 2017), critically evaluates these analyses, advancing an innovative approach, placing the politics of scale at the core of the conflicts and compromises shaping the outcomes of international interventions. Different scales — e.g. local, national and international — privilege different interests, unevenly allocating power, resources and political opportunities. In this podcast of a panel discussion, two of the book’s authors will discuss their approaches, demonstrating their utility with a case study of the Aceh Government Transformation Program. Saku Akmeemana will act as discussant, providing a policy practitioner’s perspective on the book’s findings. 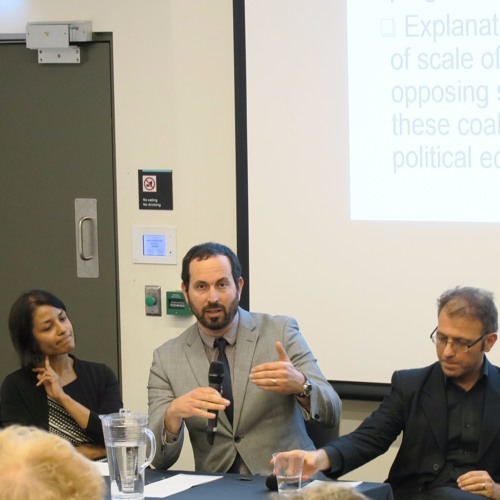 Shahar Hameiri is Associate Professor of International Politics and Associate Director of the Graduate Centre in Governance and International Affairs, School of Political Science and International Studies, University of Queensland. Fabio Scarpello is a Consultant with VJW International and an Associate Fellow of the Asia Research Centre, Murdoch University. Saku Akmeemana is the Principal Specialist, Governance, at the Department of Foreign Affairs and Trade.